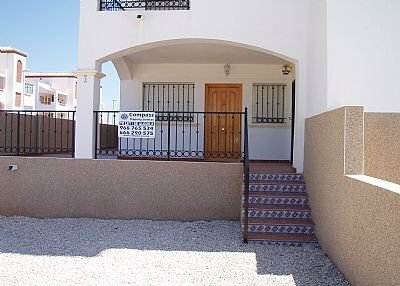 This 2 bedroom ground floor apartment located at the popular Residential La Cinuelica, R14-Los Altos, which is a 10-15 minutes walk from the beach, a10 minute walk to the local supermarket , shop, bars and restaurants. The town and marina of Torrevieja is a 10 minute drive away. The front garden is laid to stones which lead to a tiled terrace area. The living/dining room has a comfortable sofas which doubles as a sofa bed, sideboard unit with television and a DVD player (please bring your own DVD’s), wooden coffee table and dining table, four chairs and pictures. The windows looks out to the front of the property. The fully fitted kitchen has a fridge freezer, electric oven and hob, washing machine, toaster, kettle, crockery, cutlery and cooking utensils. To the rear of the kitchen is a door leading to the outside galleria area that is equipped with a washing machine. The main bedroom has a double bed, fitted wardrobes, and 2 bedside cabinets with drawers, 2 bedside lamps, pictures and duvets for the winter. The second bedroom has 2 single beds and fitted wardrobes. The property has use of a communal swimming pool which is located to the rear of the property along with the large landscaped garden. Go-Carting along the N332 is a 15 minute walk, with karts for juniors, adults and Honda’s for those requiring greater speed. Zenia Boulevard shopping centre is located 5 minutes drive away from La Cinuelica. It is one of Europes largest shopping malls with 100’s of shops, restaurants, bars and bowling alley.